2. What Causes Burnt Throat After Throwing Up? 3. What’re Symptoms of a Burnt Throat? 4. How To Make Throat Stop Burning After Throwing Up? 6. When Do You Need Professional Help? Vomiting is a discharge which forces the food and fluid out of the stomach after people eat unhygienically or when they get drunk. Yes, it is painful and disgusting, but this is not the only THING HAPPENS TO THE BODY WHEN THROWING UP. What’s even worse? People might suffer a burnt, sore throat after that, which might make it really hard to speak or swallow. The more they throw up, the more burning they will feel. In this case, everyone wants to find out how to make throat stop burning after throwing up. If this is also your concern, our post can help! What Causes Burnt Throat After Throwing Up? This is probably the biggest reason why your throat gets sore after throwing up. Gastric juices are the natural fluid in our stomach, and it is responsible for breaking down the food so that our body can absorb the nutrients. As you throw up, this fluid passes through your throat together with the food, creating THROWING UP BILE which usually leads to THROWING UP FOAM when mixed up with stomach acids. Because gastric juices have a strong acidic property (with the pH varies around 1 to 1.5), they inflammate the throat, making it burnt and sore . At this point, you might ask why don’t gastric juices harm our stomach? The answer is due to the lining that sheds every few weeks on the stomach and keeps it from being irritated and burnt by the acid. There is no such lining on the esophagus, so the consequence is a sore, burnt throat after throwing up. Our esophagus muscles are “designed” to push the food and water downward, but when we vomit, they work in a totally opposite way (pushing the food upward) as what they normally do. In other words, they are forced to reverse the working mechanism, and thus, we have pain in our throat. The problem might become worse when there is the overuse of the vocal cords and muscles in the throat, especially when the major cause of vomit is the consumption of too many alcoholic drinks. During the party, people usually yell, talk loudly or sing for a long period of time, nothing to surprise when their throat easily gets slightly sore. What’re Symptoms of a Burnt Throat? Before searching for how to make throat stop burning after throwing up, you might want to check out some symptoms of a burnt throat to make sure your throat is burning, not strep (these two conditions require different treatments). Burnt throat symptoms caused by throwing up usually last for a day with less discomfort as the day progresses. Sometimes, they suddenly go away after a few hours or become less frequent. However, in rare cases, they may last for up to 7-10 days if you develop an infection. Furthermore, for those who throw up often might experience significant esophageal damage. For instance, the consecutive burning and pressure from throwing up might cause scratches and even tears in the esophageal lining. Over time, this might lead to esophageal rupture. Besides, some might seem to experience slight weight loss due to dehydration. But DOES THROWING UP REALLY CAUSES WEIGHT LOSS, you might want to check this post to find out the answer! How To Make Throat Stop Burning After Throwing Up? This could be the simplest way to soothe a sore throat. After throwing up, your body obviously loses a lot of water. By drinking plenty of it, you compensate moisture for the dehydration caused by the stomach acid. Either warm or cold water can be chosen. While the first choice keeps your throat moist and comfortable, the second choice (with ice) calms the pain and prevents inflammation, burning and swelling, but the first few swallows may not be pleasant. An important note to keep in mind is that you should divide your drinking into small sips instead of taking in too much water at once. That’s because filling your stomach with an excessive amount of water too quickly might MAKE YOURSELF THROW UP again. So, small sips and slow drinking should do the trick. First of all, you need to make a simple solution of about 8 ounces of warm water and 1/2 teaspoon of table salt. Stir until the salt dissolves completely. Then, you will not drink this mixture as what you do with pure water. Instead, you will gargle your mouth with it before spitting it out. Repeat the gargling about 3 times a day, and each one takes for 20-30 seconds. Gargling with warm salt water helps your burnt throat get better by breaking down secretions, killing bacteria, preventing inflammation, and reducing swelling. It is also a good way to keep your throat clean as it pulls the mucus out of your throat. One important note to bear in mind when gargling your mouth with salt water is trying not to swallow the solution. For the reason, you can check out DOES SALT WATER MAKE YOU THROW UP? Many varieties of herbal tea can discomfort a painful throat as they contain various antioxidant and anti-inflammatory agents. Some herbs also contain a kind of mucilage which will turn into a gel-like matter when mixed with water, coating the mucus membranes and speeding up the healing process. Tea also keeps you hydrated, which is exactly why we should drink a lot of water when our throat is burning. Moreover, the biggest advantage of using tea over other natural remedies is that you will have great time when sipping it, and you probably know that many kinds of tea are very delicious . Chamomile Tea: It has a natural smoothing property and has been used for medicinal purposes for a very long time. Not only does it work well at easing a burnt throat, but you can also inhale chamomile steam to alleviate symptoms of cold because it prompts the immune system to fight off the infection in the first place. Peppermint Tea: It is another great option of herbal tea to soothe and numb a burnt throat. Peppermint leaves contain menthol which is an active ingredient that brings dozens of benefits. They’re considered as an antispasmodic, decongestant, and expectorant. Thus, they can decrease the likelihood of throwing up caused by drunk or motion sickness (like boat or car sick). Cinnamon Tea: Cinnamon is rich in antibacterial and anti-inflammatory properties, which means it can relieve inflammation and pain caused by the burnt throat. But unlike other kinds of tea, cinnamon is not in the form of leaves, so you’ll need to put a whole cinnamon stick into a cup of water (boiling, of course), then leave it in about 2-3 minutes. For better taste, you can mix it with honey. Ginger Tea: Since the ancient time, ginger root has used for medicinal purposes due to its healing effects and various health benefits. Similarly, you can use ginger as a tea to ease a burnt throat thanks to the ability to stop the growth of bacteria and other microorganisms that contribute to alleviate a sore throat. Slippery Elm Tea: Being a natural remedy for centuries, slippery elm contains a kind of mucilage which coats your throat. This way, it creates a protective layer which soothes your throat when it’s burnt or sore. To make slippery elm tea, you’ll need to steep 2 teaspoons of slippery elm bark powder and immerse it in hot water. Marshmallow Root Tea: Usually available at natural food at stores, this plan owns medicinal properties, including the capability of smoothing a burnt throat. In addition, the tea can relieve stomach upset, so it may help with the cause of your throwing up. Above we gave you several kinds of tea that work best for a burnt throat, here we’d like to reveal you the best way to enjoy them: sweetening it with honey. Research has shown that honey is effective at healing wound, which means it may help to promote healing for a burnt throat. Besides, honey is a natural moisture keeper, so it’s great to avoid dehydration caused by the gastric juices . So, the next time when your throat gets sore, let’s brew up a warm cup of tea mixed with a few drops of honey for added health benefits and taste. What a delicious answer to the question “how to make throat stop burning after throwing up”! There are many essential oils that has the capability of killing germs, reducing inflammation and promoting healing. Some can even help you STOP THROWING UP BILE AFTER DRINKING, which means you can prevent the root of a burnt throat. Lavender Oil: It is known for the relaxing effect with anti-inflammatory and antimicrobial properties . Eucalyptus Oil: It is often used as an antiseptic to treat cold and cough thanks to antibacterial properties. This makes it also effective at treating a burnt throat. Garlic Oil: It contains allicin, an antiviral, antifungal and antibacterial properties that against many types of bacteria. Thyme Oil: Its antibacterial abilities can fight against common antibiotic-resistant strains of bacteria. Thyme oil also diminishes muscle spasms, which means it can prevent cough – one of the main triggers causing a burnt throat. Steam Inhalation: Add about 5 drops of essential oil to a bowl of boiling water. Lean and get your face close the bowl about 7-8 inches, use a towel to cover your head and breathe in the steam through your nose within about 10-15 minutes (no more!). While inhaling, always keep your eyes closed to prevent eye irritation and being cautious of surrounding things that might spill the hot bowl. Direct Inhalation: Add about 4 drops of essential oil to a cotton ball and inhale deeply. For longer influence, you can consider placing the cotton ball next to your pillow while you sleep. 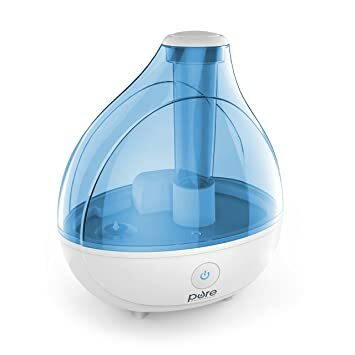 Humidifier: For the most convenient and safest way of using essential oil, you should use a cool (or warm) mist humidifier to fill the air in your room with moisture, making it much easier and more comfortable to breathe. Of course, before turning on the device, you will need to add several drops of essential oil. This way, the oil will be diffused to the air with the moisture you will inhale. Important note: Do not ingest any essential oils and do not apply them directly on your skin without diluting them first. Cayenne: It offers relief by numbing the pain. To use, add a tablespoon of cayenne pepper to 1/4 cup of warm water. Stir until the pepper dissolves completely and GARGLE. Turmeric and Ginger: They both alleviate sore throat pain. To use, add a tablespoon of turmeric or ginger powder to 1/2 cup of warm water. Stir until the powder dissolves completely and DRINK little by little. You can also make a tea with fresh ginger. If you don’t like the unpleasant taste of these drinks, you can use them to gargle, just like the cayenne. Garlic: It has natural antibacterial and antimicrobial properties thanks to allicin, an organosulfur compound known for its capability of fighting against infections. For how to use garlic to make throat stop burning after throwing up, simply add fresh garlic to your daily diet. But eating too much garlic might cause bad breath, so you might need to brush your teeth after each meal. Cayenne Pepper: Often used as a pain reliever, this spice contains capsaicin which is a natural compound known for stopping pain receptors. Despite not scientifically proven, drinking cayenne mixed with honey in warm water can help with pain relief for sore, burnt throats. ACV has natural antibacterial and antimicrobial properties that help it fight off infections. As it has strong acidic nature, it can break down mucus in the throat and stop bacteria from spreading . There are numerous ways of using ACV to treat burnt throats, depending on your preference as well as your body’s sensitivity to vinegar. One of the best ways is to mix it with honey (a tablespoon each) to take advantage of pain relief and soothing properties from the honey. Do this 2-3 times a day. If you sense a sore throat coming on, you can gargle ACV instead. Add 2-3 tablespoons to a cup of water for gargling. Repeat this 1-2 times per hour and remember to drink plenty of water in between the gargling sessions. Although natural remedies are safe, they cannot cut off your burnt throat immediately. Or your pain is severe and you need a more rapid relief. In this case, you might want to take an over-the-counter medication. But which one should be chosen for both safety and efficiency? How to make throat stop burning after throwing up using OTC medications? Keep reading on! They’re sold widely at pharmacies, and you can buy them at pretty low costs. Most sore throat sprays contain local anesthetic which will dull the discomfort of a burnt, sore throat quickly yet temporarily. As they stimulate saliva production, they also keep your throat moist and hydrated. Some recommended throat sprays are Chloraseptic, Eucalyptus and HALLS Mentho-Lyptus. No matter which one you decide to go with, always read and follow the usage directions on the packaging carefully. Lozenges are also created to provide rapid relief of sore throat pain as they contain local anesthetic. 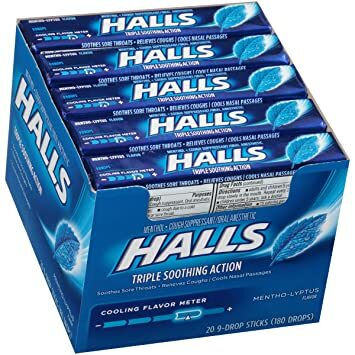 They also come in a wide range of flavors that you can easily buy at at most pharmacies, but it’s best to pick ones that have eucalyptus or menthol, as they offer cooling relief. Although lozenges do not treat the pain permanently, they can relive it quickly within 2-4 hours. For better result, you can use a lozenge along with a sore throat spray. And of course, never forget to follow the usage directions strictly. Nonsteroidal Anti-Inflammatory Medicines (NSAIDs) can get rid of a wide range of pain, including burn throat caused by throwing up, within 1-2 hours. However, you have to ensure that your throwing up is over prior to taking any pain reliever to avoid upsetting your stomach which will trigger further discomfort. Some recommended pain relievers for a burnt throat are Aspirin, Acetaminophen, and Ibuprofen. In addition to finding the proper treatments, it is important to pay attention to the selection of food you’re going to add to your daily diet. That’s because what you eat afterward contributes to determining how long it takes for your throat to recover completely. Acid reflux is not good for a burnt throat, which means anything related to acid reflux could worsen or prolong a burnt throat. For that reason, you should avoid fried foods, strong citrus fruits (like lemon or lime) and soda. Besides, don’t eat within an hour before bedtime because eating before you lie down can increase reflux release. Those foods do not have scratchy or hard components that commonly found in pretzels, dry toast, and granola. Of course, whatever foods you’re going to eat, make sure they are high in protein and calories to provide your body with energy to recover. Some recommended soft foods include soups, cheeses, pudding, milkshakes or whey protein. Some others like popsicles and bananas are also good choices for a sore throat. Although creamy foods like ice cream, ice pops, cold milk, popsicle or yogurt don’t bring much nutrition value, they can help you feel better after eating. If you want more vitamins, opt for whole fruit sorbet or make your own fruit pops to soothe the irritation. You can make soft food on your own simply by soaking the food. For example, soak pasta and rice in cold cereal, milk or sauce to make them tender. This way, what you eat is less likely to irritate your burnt throat. Another way to make food easier to swallow is to chop it (meat, egg, or fish) into small pieces before eating. For finer result, you can blend your food using a blender after mixing it with a type of sauce or low-fat gravy. Because a burnt throat does not seem to be a serious problem, most of us tend to ignore it and let it heal on its own. Although we have given you many useful pieces of information about how to make throat stop burning after throwing up, in rare cases, this affliction may last for up to 7-10 days if you develop an infection. Therefore, if the pain is too severe or doesn’t go away within 3-5 days even though you have tried out some home treatments above, it’s a good idea to check with your physician or consult a doctor. Although a burnt throat after throwing up is not a serious health problem, it’s still a good idea to treat symptoms associated with this condition as soon as possible. And trying out some of the natural remedies and OTC medications above might help your throat recover more quickly and save you a trip to the doctor’s office. Now you know how to make throat stop burning after throwing up. If you find this information helpful, don’t forget to LIKE and SHARE this article! I feel like this should be updated because I am not eating unhealthy. This post doesn’t taker in consideration that pregnant women throw up too because I just got done vomiting after eating a healthy apple .